You will find below the horoscope of Maria Rohm with her interactive chart, an excerpt of her astrological portrait and her planetary dominants. Horoscopes having the same aspect Sun square Saturn (orb 0°16'): Emma Watson, Oprah Winfrey, Charles Manson, Joseph Stalin, Salvador Dalí, George Harrison, Jane Fonda, Lenny Kravitz, Fidel Castro, Arnaud Montebourg, Malala Yousafzai, Billie Joe Armstrong... Find all the celebrities having this aspect. Horoscopes having the same aspect Venus sextile Uranus (orb 0°27'): Emma Watson, Robin Williams, Aishwarya Rai, Kate Winslet, Pink (singer), George Harrison, Gigi Hadid, Ville Valo, Billie Eilish, Lenny Kravitz, Amy Lee, Pope Benedict XVI... Find all the celebrities having this aspect. Celebrities clicked on in real-time: 577,318,741 times. Maria Rohm (Februray 25, 1943 (birth date source: her German Wikipedia page https://de.wikipedia.org/wiki/Maria_Rohm) – 18 June 2018) was an Austrian actress. Born Helga Grohmann in Vienna, she started her acting career at the very young age, working at the famous Viennese Burgtheatre as a child actor from ages 4 through 13. She continued her theatrical work until the age of 18 when she auditioned for British film producer, Harry Alan Towers, whom she would later marry. Working with Towers she became famous for appearing in a number of films directed by Jesús Franco in the late 1960s. Rohm remained married to Towers from 1964 until his death in 2009. She retired from acting in 1976, but continued to produce independent films. Rohm died in Toronto on 18 June 2018 at 72. Here are some character traits from Maria Rohm's birth chart. This description is far from being comprehensive but it can shed light on his/her personality, which is still interesting for professional astrologers or astrology lovers. 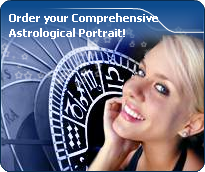 In a matter of minutes, you can get at your email address your astrological portrait (approximately 32 pages), a much more comprehensive report than this portrait of Maria Rohm. Maria Rohm, the nocturnal North-western quadrant, consisting of the 4th, 5th and 6th houses, prevails in your chart: this sector favours creativity, conception and some sort of specialization or training, with helpfulness and relations as strong components. You need others' cooperation in order to work properly, although you are not very expansive: creating, innovating and thinking are what matter most to you because this self-expression enriches you and totally satisfies you. Cheers for communication and mobility, Maria Rohm! The predominance of Air signs in your chart favours and amplifies your taste for relations and for all kinds of short trips, whether real (travels) or symbolic (new ideas, mind speculations). You gain in flexibility and adaptability what you lose in self-assertion or in pragmatism. The predominance of Water signs indicates high sensitivity and elevation through feelings, Maria Rohm. Your heart and your emotions are your driving forces, and you can't do anything on Earth if you don't feel a strong affective charge (as a matter of fact, the word "feeling" is essential in your psychology). You need to love in order to understand, and to feel in order to take action, to the detriment of a certain vulnerability against which you should learn to fight. Fire's qualities are not very present in your chart, with only 8.67% instead of the average 25%, which means that you may lack warmth, enthusiasm, conquering spirit, or energy. You may look indifferent to others, with almost no desire, no joy of life or no enterprising ability. Actually, it is not true, but you should let go, force yourself to be more daring, and show your amazement as well as your vitality. You certainly have as much energy as others, you just need to release it, and it is up to you to display more of it, since it will be all to your benefit: shout, sing, pull faces, dance! That's the right mean for you... In the end, you'll never be accused of being sad, phlegmatic or a killjoy! The Mutable mode is the most emphasized one in your natal chart, Maria Rohm, which indicates a mobile character that is curious and thirsty for new experiences and evolution. You are lively and flexible, and you like to react quickly to solicitations, but don't confuse mobility with agitation, since this is the danger with this configuration - and with you, stagnation is out of the question. Security doesn't matter as long as you are not bored. You optimize, you change things, you change yourself... all this in a speedy way. Cadent houses, namely the 3rd, 6th, 9th and 12th houses, are very emphasized in your chart, Maria Rohm. They indicate important potential for communication, adaptability and flexibility. These houses are symbolically linked to the mind and intellect. The relative weakness implied by these characteristics indicates your tendency to hesitate or to be indecisive, but also your remarkable ability to start off again, which is a nice quality, finally: you can easily get yourself out of a tight spot thanks to your mobility and casualness, in the best sense of the term. This group of houses corresponds to evolutionary characteristics of your personality. However, they are only indications and you must include them in the rest of your chart in order to see whether they are validated or not! In your natal chart, the three most important signs - according to criteria mentioned above - are in decreasing order of strength Gemini, Virgo and Pisces. In general, these signs are important because your Ascendant or your Sun is located there. But this is not always the case: there may be a cluster of planets, or a planet may be near an angle other than the Midheaven or Ascendant. It may also be because two or three planets are considered to be very active because they form numerous aspects from these signs. After this paragraph about dominant planets, of Maria Rohm, here are the character traits that you must read more carefully than the previous texts since they are very specific: the texts about dominant planets only give background information about the personality and remain quite general: they emphasize or, on the contrary, mitigate different particularities or facets of a personality. A human being is a complex whole and only bodies of texts can attempt to successfully figure out all the finer points. You are a “free-thinker”, Maria Rohm, and you tackle problems with a swift and efficient mind. Freedom, progress and originality are your driving forces. You are resolutely future-oriented and with ingenuity and inventiveness, you reform what is outgrown and you constantly innovate: psychology, computer sciences, new technologies... have almost no secret for you. Your human and idealist qualities are obvious, you are a very pleasant and interesting interlocutor, even though your rebellious and revolutionary side may be criticized. Indeed, you seem to be driven by a strong argumentativeness: you seldom share your friends' views and, although you may come across as obstinate, intransigent and unpleasant, you do not hesitate to speak the truth! Instead of causing sudden break-ups with your friends, it is advisable that you express your creative potential more persistently whenever your nervous tension is too high. Love at first sight, flash in the pan, amorous impulsiveness? All these are part of your way of loving or to fall in love, Maria Rohm. Throughout your relationship, you maintain this kind of jerky and lively style, that may seem childish or naïve, but that is so generous and cheerful! You are undeniably possessive and you are not concerned with your partner's opinion but, fortunately, you readily forgive because of your spontaneity and your authenticity. When your relationship is intense, everything is fine. There is no romanticism, no complications with you. You love with ardour and, except for a few crazes and opportunities for new pastures here and there, the only danger may be that boredom settles in. In that case, you leave without regret and you quickly forget what consumed you, not so long ago. The ruler of the Ascendant, Maria Rohm, is Mercury. In the sign of Aquarius, it adds a note of eccentricity and inventiveness into your chart, as well as warmth and the knack for establishing contact with people. You enjoy undertaking numerous projects. An individualist, you paradoxically like to set up and participate in groups of discussion, provided that your originality is appreciated as it deserves to be. Maria Rohm, you are so resistant and so solid that you are able to cope with any challenge, any ordeal. You behave with persistence, rigour and discipline. You are so obstinate and patient that no effort is impossible to you, as if sensitivity and emotions were unable to divert you from your goals. With calm and lucidity, even coldness, you face up to things and you plan on a long-term basis. Nothing and no one can prevent you from fulfilling your responsibilities. You are a rock, a hard worker, and your iron will equals your resistance to blows. Your practical sense is at the service of your ambition which is real and energetic, even though it may not be obvious. Sexually, you are active and vigorous. If you show more warmth, you may become an excellent lover; indeed, being demonstrative is not your major concern. This text is only an excerpt from of Maria Rohm's portrait. We hope that it will arouse your curiosity, and that it will prompt you to deepen your knowledge of astrology, as well as to visit and use the wide range of free applications at www.astrotheme.com.